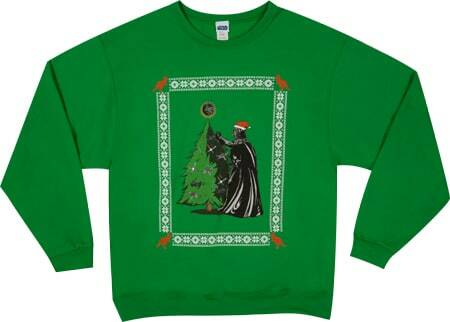 Well, it’s not really and ugly Christmas sweater, it’s a sweatshirt! Even the Empire celebrates Christmas. Here’s our Faux Star Wars Ugly Sweater with Darth Vader putting the final touches on the Super Star Destroyer’s Christmas tree. Unlike us normal folks who have to deal with scratchy arms and step ladders to decorate the tree Anakin simply uses the force to drop the Death Star angel in place. I’m sure he made some Storm Troopers place the little Tie Fighters and X-Wing Fighter ornaments. This design was Kevin’s idea. He was crushed once he found out we were labeling it as ugly. 80sTees released loads of new Star Wars items recently, so I’ll probably be posting a few of them since there’s some good ones in there.